A captivating mix of old traditions and new wave popular culture, South Korea is arguably our new favorite Asian hot spot. With a deep-rooted history evident in every beautiful temple you have the opportunity to see, and a fast paced foodie scene to tickle your taste buds, it’s hard to believe that there’s also a dramatic coastline to complement this. Our travel experts have curated a sensational seven night itinerary to give you the perfect introduction to this relatively untouched nation. Our cultural adventure that starts in the capital and takes you on a trip through two more incredible cities, the historic capital of Gyeongju and the bustling town of Busan. There’s nothing not to love in this unique place and our trip is full to the brim with exciting sights, sounds and tastes round every corner with our fascinating guides who will show you the best of the country. On your first night in South Korea, explore the city of glistening skyscrapers and buzzing street food markets. Your base for the next few nights is the glamorous Four Seasons, set in the heart of downtown Seoul and is the perfect place to rest your head after a night immersing yourself in the city’s best spots. 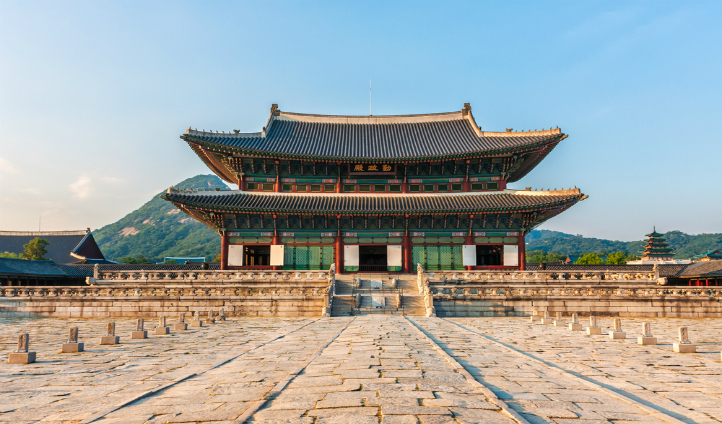 After a good night’s sleep, head off on a private tour of the city’s historical landmarks, starting with the impressive Gyeongbokgung Palace, the city’s most beautiful palace. Whilst here, take a peek inside the National Folk Museum of Korea, full of artefacts from years gone by in Korea’s agricultural and domestic heritage. The traditional and beautiful Bukchon Hanok Village vividly evokes the cultural history of the city, with a mixture of tea houses, guesthouses and cultural centers to introduce you to the Korean way of life. Visit the nation’s first ever market, Gwangjang, and pick up some beautiful silk & satin for very reasonable prices. For the art lover, a trip to Insadong Antique and Art Street, with over 100 galleries in the area, will not disappoint. Your third day here is one for quiet reflection and a chance to learn about Korea’s turbulent and fascinating past. As the only divided country in the world, South Korea’s Demilitarized Zone (aka the DMZ) runs along its border with North Korea, with a 4km buffer zone. This, one of the last relics of the Korean War, along with Korea’s War Memorial, are an essential stop on this exploration of such an intriguing country – it really is fascinating. Look out from the observatory into North Korea, venture into the third tunnel that was only discovered in the 1970s and hear the sounds of North Korea’s propaganda blasting out from their side of the DMZ. Your next stop is just an hour’s flight away down south in Busan, ‘the city on the beach.’ As South Korea’s second largest city, it has plenty to offer the discerning traveler, on land and on the water. It’s from here that you can embark on a boat trip to the island of Geoje, as well as Japan if you’re feeling adventurous. Your bolthole here is the elegant Park Hyatt, set in the heart of the city’s chief beach and storeping district, a perfect location to explore the city from. Take a night time trip up the Busan Tower for a spectacular panoramic view of the city below. Locals and visitors alike gather here to awe at the Statue of The Great Admiral Yi Sun-Shin, the flower clock and the Bell of the Citizens. If you’re a sucker for seafood, the Jagalchi Fish Market is an essential stop on this Busan tour. Famous across the country, you’ll be spoilt for choice here with the opportunity to taste fresh fish every day. Our favorite stop on this sojourn is at the colorful – both physically and historically – Gamcheon Culture Village located outside of the main city. 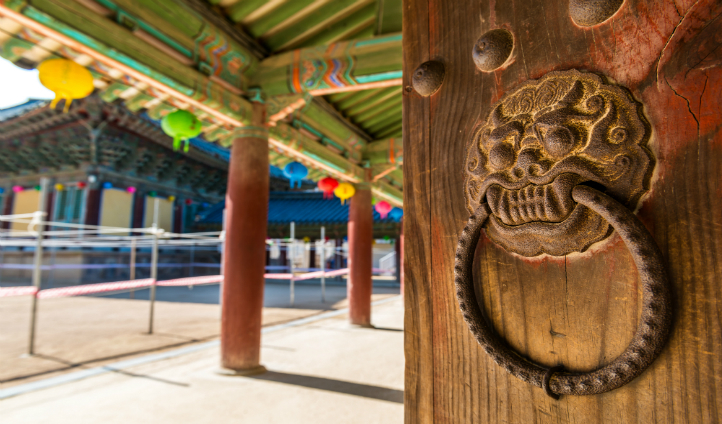 As you explore the vibrant streets of this community, learn about the origins of the Taegeukdo religion, famed for its belief in the power of ying and yang. During the Korean War, the village was used as a safe haven for refugees, and today has been transformed into a quirky hub of cafes and galleries. Head to the coast for a taste of the natural environment at the Taejongdae National Park as you peer over the towering cliff edge to the ocean below from the lighthouse here. There is even a temple hiding on the cliff edge here too. Head north on a short train ride through the Korean countryside to Gyeongju, the historic capital of South Korea, and a perfect end to your adventure through this historically vibrant nation. First stop is your place for the night, Gyeongju’s spectacular Hilton. From here, head to the magical Anapji Pond, where the reflections of Donggung Palace will soothe and amaze you all at once. Next up is 200 year-old Yangdong Folk Village, a beautiful contrast to Busan’s culture village, and yet another window into the cultural history of the area. If the opportunity arises, a stay overnight here is an unmissable experience. Head back into the bright lights of Seoul for one last night, all the while reflecting on such an eye-opening trip. You’ll wonder why you didn’t think of this wonderful place before. So put down your guide book, this trip is South Korea brought to life.